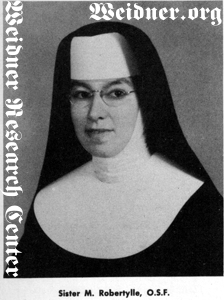 Sister M. Robertylle, O.S.F., Lidwina Weidner. Courtesy of Solemn Blessing and Dedication of St. Mary's School; Buffalo Grove, Illinois. October 5, 1947. p. 54. [S11] John J. Weidner, Compiled Birth, Death, 606. [S150] Arlington Heights Herald, 15 Sep 1955, p. 14, col. 8, Obituary indicates she is buried in the convent cemetery. However, the Archdiocese of Milwaukee Cemeteries website, http://www.cemeteries.org/genealogy_03.asp, indicates she is buried in Mount Olivet Cemetery, Milwaukee.